The scene inside the Heights Bar in Loughinisland after UVF gunmen murdered six men who were watching a World Cup football match in June 1994. American film-maker Alex Gibney has urged people to “raise ruckus” over the arrest of two men behind a documentary about the Loughinisland massacre. In a tweet on Friday morning, Alex Gibney, who directed ‘No Stone Unturned,’ reported that his producer Trevor Birney and journalist Barry McCaffrey had been detained by police. Early in the day, the PSNI reported the arrest of two men, aged 51 and 48, in Belfast in relation to the theft of documents from the office of the Police Ombudsman NI. 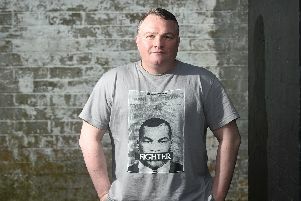 The film drew considerable controversy upon its release in November last year for naming one of the suspected gunmen in the UVF murder of six men at The Heights bar in 1994. Officials from the ombudsman office reported the theft of the documents to the PSNI, who in turn asked Durham Constabulary to conduct an independent investigation. Detectives from Durham Constabulary, supported by officers from the PSNI, executed search warrants at three properties in the Belfast area on Friday.